Glory Invasion: Walking Under An Open Heaven ReviewI am totally amazed at the revelation that God is pouring out on mankind in these last days. It is as if God has heard the cry of mankind and is answering it and using anointed authors to share it with us. Some of the books that I have been privileged to read and review have caused me to grow with leaps and bounds in my Spiritual walk, and I am thankful. 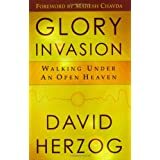 This new book by author David Herzog , Glory Invasion, joins the ranks in my opinion, as one of the most encouraging, exciting, and spirit-charged books that I have read. The revelation that he brings to the table I can only call life-changing. There have been several times lately, in certain books that I have read, where I actually feel the excitement of the Spirit of God inside of me as I digest the revelation that I am receiving, this was one of those times. I found myself reading several pages and actually putting the book down so I could meditate on the wonder of the words that I had just read. As a Christian, nothing is more important than following where God is leading, and being in the depths of the flowing waters of His Spirit; David shares where God is going and how to follow and be one with Him and His Glory. Outstanding! In this work you will understand how creative miracles happen, how to receive supernatural provision and help in awakening your prophetic destiny from its sleep. You will realize God has something wonderful for you to do and through the words of this book, your spirit will have the encouragement to run to complete the race set before you, and you will see and understand that indeed there is more, much more, awaiting you as a Christian. And you will deeply understand, we do serve a 'Mighty God,' who is indeed more than enough to defeat lack, sickness and all the other obstacles that have darkened your door. How exciting is that? It's time to rejoice, and fill your mind and spirit with words that will make a difference and change your life. You will find those words in this anointed book; I would never attempt to try and explain in such a short review the deep revelation you will receive, but believe me, they are there. I highly recommend Glory Invasion to you. It's time to go to the next level of His Glory and this book will help you make the climb. Thank you David for sharing this revelation with us; God's hand is truly upon you. Want to learn more information about Glory Invasion: Walking Under An Open Heaven?